Turn your smartphone or mobile device into a powerful gaming machine with this powerful VR Headset! Mobile virtual reality is here. With a Sneba VR Glasses, you can play amazing games, and watch 3D movies in your own private cinema. The VR Headset drops you right into the action! •Made of recyclable ecofriendly materials, it is lighter than similar products so you can play and watch more comfortably. •IPD adjustment: Our virtual reality headset is capable of displaying 3D films, stunning 360 degree interactive photos and videos without ghosting. It blurs the limits between reality and your imagination with these unreal virtual reality goggles headset. Easily enjoy the immersive 3D effect through smartphone. •Aspheric optical lens design,0-600 ° naked eye viewing support, 600 ° or more to support the use of glasses, Pupil distance and focal distance could be adjustable, brings you stunning immersive 3D experience. •Ultra-light weight reduces stress on your face, convenient for you to carry, and lets you enjoy 3D life anytime, anywhere. Need a Samsung gear VR, oculus VR, VR for iPhone, VR headset for iPhone, VR 3D, VR iPhone 6, VR goggles? Our VR Glasses will launch you into a whole new dimension of fun! Fully Compatible with iOS and Android, enjoy 3D life whenever and wherever. Our professional team serves customers excellently and provides support for both pre-sales and after-sales issues. We have a hassle free, 'No Questions Asked' Refund Policy so you can confidently Add To Your Cart and checkout without worry. You'll be glad you did, we promise. If you have any question about our virtual reality headset, please do not hesitate to contact us via E-mail. We genuinely care about our customers and will reply promptly within 24 hours. 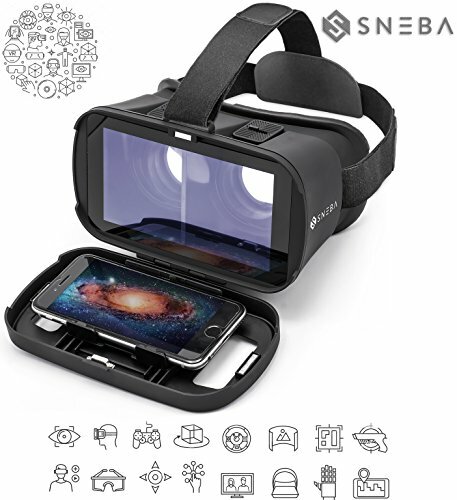 ✅COMPATIBLE VR HEADSET WITH ALL SMARTPHONES: Sneba virtual reality headsets 3D VR glasses cardboard work with smartphones and mobile devices like iPhone 7/6 plus/6/5s/5c/5 Samsung Galaxy s5/s6/s7/note4/note5/edge Google Pixel and Other 3.5 - 6.0 smartphones iOS/ Windows /Android like LG Huawei HTC Nexus Sony to bring you a totally immersive visual 360 experience. Boasting HD optimization and 3D gaming support you'll put yourself right into the action with games movies and more! ✅EASY FD OD ADJUSTMENT: Gaming and watching movies in VR boxes works best when your eyes properly align with the screen box. That's why our Google cardboard offers FD and OD adjustments wide FOV to expand the viewing angle and perfectly match focal distance and unilateral myopic alignment for reduced distortion. ✅REVOLUTIONARY OPTICAL SYSTEM: It completely eliminates vertigo. Fit everyone's eyes including those with those with near-sightedness. Pupil settings for the best 3D experience. Innovative design 3d vr gear comfortable super lighter weight wearable and adjustable straps for flexible wear. ✅ERGONOMIC DESIGN: The adjustable strap in VR goggles glases is made of lightweight material which can decrease up to 30 of pressure around your eyes and on your head providing you a more comfortable feeling. This Flexible and adjustable headband is suitable for different people its extremely soft and thick foam is perfect long time use. If you have any questions about this product by sneba, contact us by completing and submitting the form below. If you are looking for a specif part number, please include it with your message.